The Oaks Gourmet Market was a bit of drive from the world headquarters, but I had a meeting to attend, and that area of LA was the halfway point. 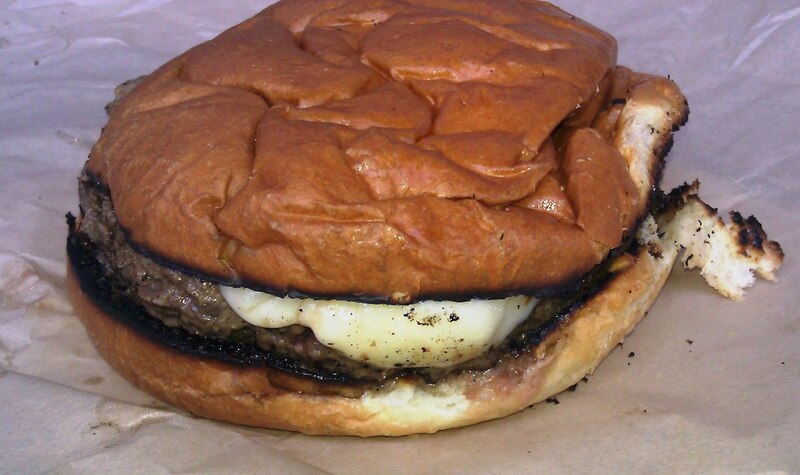 Both LAist.com and the LA Weekly had recently raved about the burger at The Oaks Gourmet Market. My experience was nothing like what the other reviewers had reported. "...The Oaks Gourmet was established in 2009 with the idea that a small, neighborhood market could serve high quality, delicious food and beverages at a fair price. Our friendly, informative staff are always on hand to attend to all your needs, while maintaining that local hometown feel. Our emphasis on service, and selection... " All these words were just that....words. Note that the front of the menu clearly stated "TOP 5 BURGERS IN LA". This led me to believe that the staff had some pride in the..........burgers. I asked the attendant at the cash register what sort of beef was in the burger. She muttered something about it being dry-aged. I pressed on and asked her if she could let me know which cuts were used. She asked me how I wanted my burger cooked, and I wanted to try the burger in the best possible light for my review. This additional level of complexity resulted in her grudgingly calling over to the kitchen to try and find the chef during the lunch hour. The chef was nowhere to be found. Finally, a manager type walked over to assist. The origin of the bun and cheese--why bother? It was an ordeal just figuring out what sort of beef was used. I gave up on trying to discover things prior to tasting the burger. I did ask her to send the manager over later, but that never came to pass. I ordered a Dry Aged Burger for $11.50. It was a half pound burger on a brioche topped with Taleggio cheese, red onion, tomato, arugula, Black Forest bacon, and a pineapple compote. I ordered all of the extra toppings on the side. No fries came with the dish. 15 minutes later, I attempted the Sisyphean task of obtaining what I had ordered. Round 1 -- No cheese on the cheeseburger. Round 2 -- I returned a Med-Well burger in hopes of receiving a Med-Rare burger as I had ordered. Round 3 -- The burger came to me Med-Well again. Another patron, who witnessed this, told me that he had given up on the burgers at The Oaks Gourmet Market, because they always over-cooked them. I followed his lead, and I gave up and settled for my Med-Well burger. I finally seemed pointless to keep sending back burger after burger in hopes that the kitchen staff would suddenly start caring enough to cook what I had ordered. The Beef: This was a dryish blend of Chuck, Short Rib, and Sirloin trimmings. The beef smelled weakly of aging, but that flavor barely came through. This was likely due to the over-cooking. The burger was mildly beefy--it had no mineral notes--all the blood was lost to the cooking process. The juices had mostly abandoned the burger, as well. This left me with a loose, 1/2 pound disc of dry blah. The Sear: This was puzzling. While the kitchen managed to burn the heck out of the bun, they only got a meager sear on the over-cooked patty. The only taste of char came from the burnt bun (gross) and the bits of carbon that adhered to the burger from the grill. The Seasoning: The beef was nicely seasoned. This was the one of the few high notes of the experience. The Preparation: The dry-aged blend was ground relatively finely, and it was loosely formed into thick patties. The kitchen did not bring its A-game to the Friday lunch rush. The burgers were sloppily and hastily thrown together, and they were cooked with absolutely no regard to presentation or customer preference. The too fine grind of the beef did not serve the dish well. A coarser grind would have retained some juice and flavor even with the over-cooking. The Cheese: The interior part of the Taleggio cheese was creamy, salty, and rich and it served to moisten the dessicated beef. Unfortunately, they served me the rind of the cheese, too. It was bitter, and that was a flavor, which was unwelcome considering that the bun was already charred. That charred bun lent PLENTY of bitterness to the bite. Besides, GROSS...that was nasty. Leaving the rind on the cheese was a lazy, sloppy, careless, rookie move. The Bun: Did I mention that it was burnt? The bun was otherwise unremarkable. It was probably moist prior to being converted into graphite. Note the thick, white, cheese rind on the left side. The Meat To Bun Ratio: The dry, burnt bun was too much for the dry, over-cooked beef. The Toppings: The bacon was thick-cut and more sweet than anything else. It was also served at room temperature, so I imagined that it had been prepared well in advance....sigh. The compote topping never materialized, so I can't tell you anything about that. The Value: Really? I boxed up half of the burger so that a co-worker could experience what I had. He was equally unhappy with the experience. His reaction was, "Dude, it sucked, man." I respect the fact that the reviewers at LAist and the LA Weekly must have had very different burgers than I did. What I got was weak service, sloppy preparation, and burnt food. On this occasion, the kitchen staff made concerted and repeated efforts to ensure that the quality of the ingredients would be masked by careless handling and preparation. Burger Review : NO! I couldn't choke down more than 50% of this beast. The beef would likely have been fine had it been prepared by a competent staff. The Oaks Gourmet Market management should be embarrassed at what their kitchen was turning out. way to flatten the burger for the pic.... what an "accurate" representation. Thanks for providing an opportunity to clarify. 1. That's how the burger arrived--squished. The photo is a shot of what I received from the kitchen. 2. The burgers are sampled sans toppings prior to anything else to gauge the quality of the meat, bun, and cheese. This is the process. A bad burger with great toppings is still a bad burger. Quality topping can serve to obscure weak fundamental ingredients. In the case of this burger, it was supposed to be pretty close to steak considering the fact that it contained Sirloin. 3. As stated in the review, the pineapple/jalapeño compote never materialized on any of the three tries to deliver the correct burger. 4. I have already been in touch with the owner of The Oaks Gourmet Market to let him know that there were some quality control issues at his restaurant. He assured me that he is addressing this, because this was not the sort of burger that he envisioned serving the public.